Apple Cinnamon Baked Oatmeal. One of my favorite things to make this fall has been apple slices in the slow cooker. Slow cooking the apples allows the natural sugars to come out so much less sugar needs to be added. It will also fill your house with a pleasant aroma eliminating the need for any scented candles. Try my Crock Pot Applesauce sometime too. I also love oats and created this dish to combine the two together. It came out really good! This dish would be perfect for a holiday brunch or for Christmas morning. You can cook the apples overnight or the night before so the dish can come together pretty quickly. They freeze well too just in case you may have leftovers. Another great thing to use the apples in is my Healthy Apple Cobbler. Yum! For the slow cooker apples, put all ingredients in the crock pot. Turn on high and cook for 3 hours. Stirring occasionally. Once the slow cooker apples are done, preheat oven to 350. In a large bowl, combine the oats and applesauce. 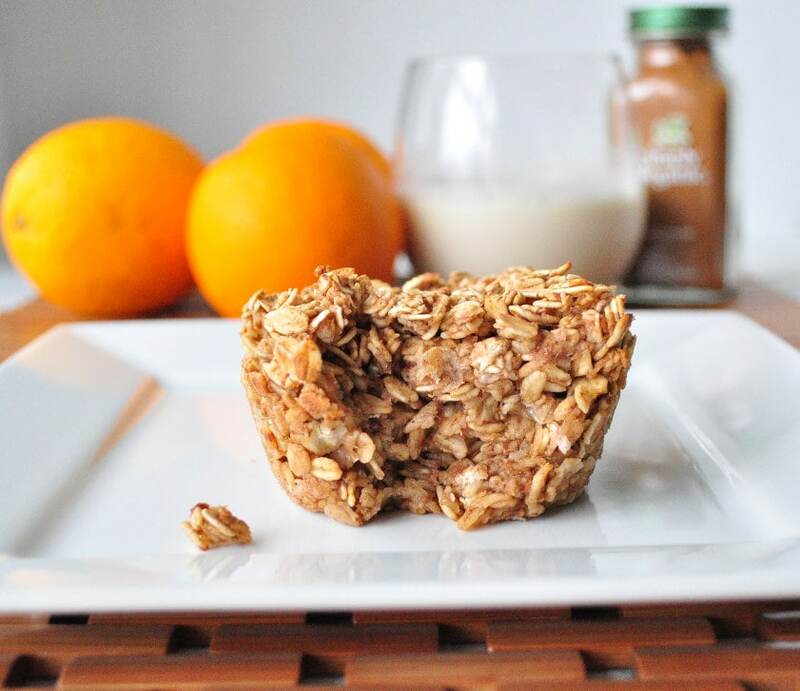 Using a slotted spoon, add the crock pot mixture to the oats and spoon onto a greased jumbo muffin pan. Sprinkle the top with a pinch of sugar. Do you have any baked oatmeal recipes where you add an egg? Just curious. Thanks! I’d like to make in a 13x9 for a potluck. Should I increase amounts or leave as is?